Is There Soccer In Heaven? I wonder if they have soccer games in heaven. And if they do, I wonder if it’s a perfect 65 degrees with a slight breeze from the south when I sit facing north, or a westerly wind when I’m watching the game from the east. I wonder if they’ll have cushioned seats instead of the sack chairs I’ve carried for the past 20 years. Since time would be irrelevant in heaven, I’d be able to watch my sons and grandsons and great grandsons kick the ball back and forth over and over and over again. I could move from one soccer game to the next, no one ever getting tired, no one getting sunburn, no one getting soaked from the torrential downpour that started at kick off. The fields would be enormous — large enough so that my ever-expanding family could picnic and play volleyball and drink Piña Coladas without getting drunk. Each family member’s game would be at their own special separate time — no running from field to field to catch parts of each kid’s game. In heaven I wouldn’t be chubby, giving in to sweating in all the wrong places as I cheer my grandkids and kids and great grandkids on. I’d be tall and thin and my flowing shift would match the kid’s uniforms. There would be more than enough treats and drinks for each team, everyone getting their favorite juice box and granola bar or Capri bag and bag of Cheetos. No arguing. No pouting. If there are soccer games in heaven, there will be a balance of winners and losers. Except in heaven, there really is no losing, is there? There would be no obnoxious parents telling the ref he’s blind, no cheap shots at the goalie, no broken ankles or concussions from being t-boned on the field. No one will feel like a loser, because in heaven everybody is equal and happy and good natured. Now there may be a question about which of your kids’ age groups you want to watch. I mean, I watched my youngest from kindergarten through high school. He was amazing all 13 years. I watched my oldest almost as long. Do I want to watch my grandson at age 7 (now) or when he’s 10 or 15? I figure God will have figured that out by the time I get there. I mean, She’s/He’s omnipotent and all. And in heaven everything is possible. My only dilemna is….what if 2/18 wants to play football? I like your blog it was interesting to read and enjoyed how you talked about you and kids. I like you support your kids through thick and thin. It was interesting how you explained about there being soccer in heaven. 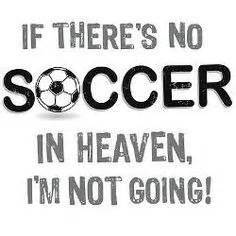 It sounds nice actually for there to be soccer in heaven sound nice, and relaxing. I hope you write more about this because it was fun to read about. In heaven? You’d be the exact same miracle you are today. You are my angel, David! You’ll be ok, you’ll be there watching grandma, where ever that time or place may be….